Cindy Lou Who proved that being cute won't stop the Grinch from stealing your Christmas tree. Luckily, Santa's posse has other strategies up their fuzzy red sleeves. The University of Minnesota was losing dozens of evergreens worth thousands of dollars from its grounds every Christmas season. Rather than buying trees, thieves were carrying away entire trees or cutting the tops from larger evergreens to use as holiday decor. That ended when the University's land care team began spraying the trees with skunk scent. The Pepé Le Pew plan is working: Since 2012, not one stinky tree has disappeared. If you're fresh out of skunk spray, fox pee will do the trick. In Lincoln, Nebraska, the parks department's holiday shopping list includes four gallons of fox urine from a trapping supply company. Parks workers spray city trees with the urine and post signs warning that the scent becomes unbearable indoors. For a double whammy, the city added a hint of skunk essence to its fox urine in 2012 and didn't lose a single tree. Rounding out the olfactory category is a sulfurous concoction used in Port Republic, New Jersey. Port Republic Mayor Gary Giberson said he doesn't know what the chemical is, but it smells like rotten eggs when it's brought into a warm home. Would-be tree thieves have stayed away since the town introduced the spray with accompanying warning signs. It's the seasonal version of the fake ADT sign. The Sheriff of Lancaster County, Nebraska described a rural homeowner who deterred tree thieves for several years by posting warning signs without actually spraying the proclaimed scent. That homeowner's luck ran out when, assuming his tree had grown too tall to steal, he stopped posting signs and lost the tree. Minnesota's Department of Natural Resources staked out a North Woods property for two nights to catch a young couple in the act of stealing spruce trees from government land. The Yuletide Bonnie and Clyde had cut down nearly 2000 trees, which they planned to sell, before they were arrested. As Scoutmaster of Boy Scout Troop 374 in St. Louis, Mark Wilbur battled Christmas tree theft for 30 years. On a blog for Scout leaders, he recalled that "when heating oil was 50 cents a gallon and before guns started appearing in robberies," Boy Scouts took turns sleeping at the troop's tree lot to discourage thieves. Today the members of Troop 374 stay nestled snug in their beds while security cameras keep watch for them. But the cameras haven't quite earned their badges. They've recorded the same woman raiding the troop's Christmas tree lot three years in a row without aiding in her arrest. The Irish Christmas Tree Growers Association isn't relying on cameras to ward off would-be bandits. Member growers hire security guards on their farms, and the Irish police have launched air patrols to catch gangs of tree thieves. 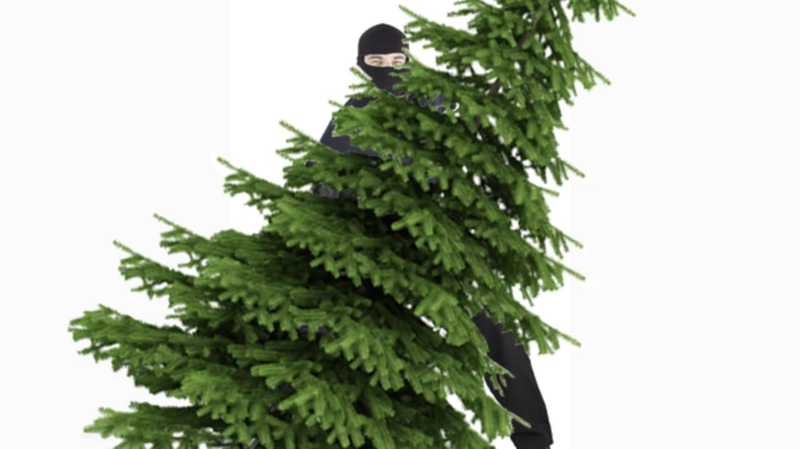 Meanwhile, police in East Dorset, England have introduced "secret tracking equipment and DNA technology" into trees and other holiday items sold at local garden centers. When the effort eliminated tree thefts in 2012, the police decided to make "Operation Pine" an annual tradition. Not all British counter-Grinch-telligence operations are worthy of James Bond. A shop assistant in Wales merely followed a trail of tinsel out the back door to apprehend a man who stole items from the shop's Santa display, including a fully decorated tree.